Occupational therapy (OT) is a science-driven, evidence-based profession that enables people of all ages live life to its fullest by helping them promote health, prevent or live better with injury, illness, or disability. 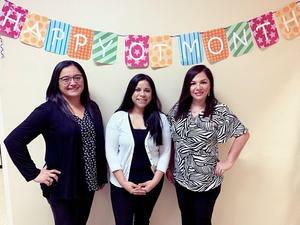 San Benito Schools’ OT staff members are, from left, Jessica Lara – certified occupational therapy assistant; Luz E. Gonzalez, occupational therapist; and Bettina Cisneros, occupational therapist. We THANK YOU for empowering the individuals that you work with to live life to its fullest!